A group of Homes for Heroes Affiliates in Mishawaka, IN wanted to remind everyone the true meaning of Memorial Day. So they placed hundreds of flags at unmarked graves to honor and keep the memories and service alive of the military members buried there. The group placed 108 flags throughout a small portion of the cemetery. With so many unmarked graves throughout the cemetery, the group would not have been able to place flags at all the unmarked graves with 500 flags. 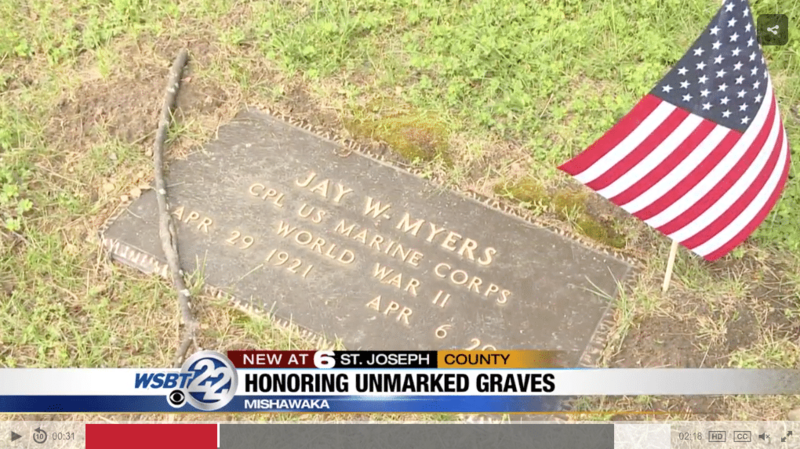 “Just seeing that they’ve served and they’re unmarked in a time when there’s so many marked graves we just feel like we can do our small little part of honoring them and keep their memories and service alive,” said Jim McKinnies with Homes for Heroes. For Rick Switalski, placing these flags at St. Joseph Valley’s Cemetery has a special meaning. Rick’s friend Mark Lennon is buried there. After three years of service, Rick came home. His 21-year-old friend Mark, did not. “When Mark was killed he probably had about six to seven months left on his tour. He was my best friend, and we did a lot of things together and we were planning on getting out together and it didn’t work out together so you never know,” he said. Switalski says he’s tried to live his life honoring Mark’s memory. To read more on this story from WSBT 22, click here.